Most of Pickens County's early industry revolved around the marble industry. Georgia Marble Company is located in Marble Hill near Tate. The Tate Elementary school is built out of marble. The marble was also used to make the statue of Abraham Lincoln in the Lincoln Memorial. Most of the marble is white, but there is also very rare pink marble. It is one of the few places in the world where pink marble is found. The marble is also used for tombstones for the United States Military. Pickens County has seen very rapid growth with the building of Georgia State Route 515, locally referred to as the '4 lane'. Many new businesses and residents continue to move to Pickens County. 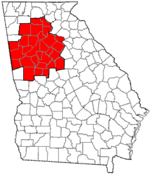 ^ "Pickens County". Retrieved June 28, 2014. This page was last edited on 11 August 2018, at 11:17 (UTC).